Home > Law Books > Lawyering Skills > Ineffective Assistance of Counsel, 2018-2019 ed. Ineffective Assistance of Counsel, 2018-2019 ed. 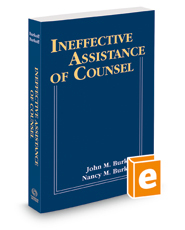 Ineffective Assistance of Counsel discusses the development of ineffective assistance of counsel, evaluates the current state of the law, and provides guidance for those who encounter ineffective assistance claims. It also provides in-depth coverage of state and federal constitutional standards for ineffectiveness and applications of standards in pretrial, trial, sentencing, and appellate settings. You'll find hundreds of carefully indexed cases, plus analysis of Supreme Court decisions concerning Sixth Amendment and ineffective assistance of counsel issues. Section one details the development of the legal standards, while section two focuses on the application of those standards by the courts.